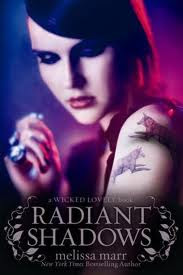 Radiant Shadows is the fourth book of the Wicked Lovely series. Like the other books in this series, it follows along the same story... but branches off into different characters. I was once again waiting to find out more about Aislinn and Seth... but it didn't quite go there. While the book is somewhat a story in itself, I think if you just picked up this book before reading the previous ones you would find yourself extremely confused while trying to catch up with who is who. I recommend starting at the beginning. I will say I enjoyed this book... it was definitely a page turner. I was up until unreasonable hours of the night, especially towards the end. That said... I don't think I enjoyed this book as much as Wicked Lovely (the first book of the series). I'm still wishing they would get the focus back on Aislinn, Seth, Keenan and Donia.